Edward Zwick, director of one of my favorite films, Glory, co-wrote and directed one of the better Holocaust/WWII movies released last year---Defiance. 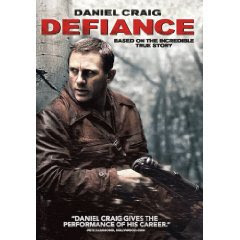 It is based on the book about the true story of the Bielski brothers---Tuvia(a most un-James Bond-like Daniel Craig), Zus (the always excellent Liev Schreiber) , Asael (Jamie "Billy Elliot" Bell), and the youngster Aron(George MacKay)---who were hiding out in the Belarussian forests and ended up saving fellow Jews. The film is, by turns, depressing, inspiring, disturbing yet always hopeful and engrossing. Mr. Craig's unlikely hero Tuvia, is resolute in protecting and sheltering their little community but like any human, hems and haws at certain crucial moments. Zus as played by Mr. Schreiber (in a preview of his Sabretooth performance in X-Men Origins: Wolverine) is the unwavering, hot-headed sibling in competition with his brother for leadership. Jamie Bell's Asael gradually grows into his position of authority in the camp. Great performances all around. The movie brings to light a little-known WWII story, and stories of heroism and Jewish resistance like this should definitely be told. The filmmakers present the brutality of war, the Red Army's bravery while not tiptoeing around their anti-Semitism, the collateral damage, the courage of people who helped the Jews, the moral dilemma of those who collaborated with the Germans, among other conundrums. In one cringe-worthy scene when a German soldier was captured, we see how victims can easily turn into the kind of persons they probably didn't think they were. There's a lot of "What would I have done?" moments as you watch the film. See this film for you'll see the many aspects of our humanity: our survival instincts, our strengths, our flaws, our capacity to hate and thankfully, our capacity to love. The DVD comes out 02 June. You might also want to check out this book on the Bielskis.